The Messy Cooker: Here with me today is my friend, The Really Messy Cooker. He is a Bob’s Burgers fanatic and self-described amateur cook. But to me, he’s a natural. I aspire to attain his state of tranquility while cooking. He doesn’t release beads of sweat, like I do, when pot lids start exploding. Without further ado, here is The Really Messy Cooker! The goat cheese was smooth, the shallots and thyme…delightful. The recipe called for arugula, which I personally believe to be the food of those who aren’t fortunate enough to have better greens. It’s the garnish of the peasantry, so I substituted baby spinach gently warmed (not fully cooked) with red wine vinegar. I bought meat from Whole foods, which could also be named “whole paycheck,” but they do have the best meat. I got reasonably priced meat from a cow who was grass fed, free range, spiritual and, from the butchers account, charming at parties. It was very good meat. I used sourdough rye bread, but I recommend a more standard bun. The bread was delicious, but unwieldy and flaked off in crumbs too easily. The meat patties were handcrafted with 3 eggs mixed into the meat and made in a chaotic high-energy environment (I randomly picked things up and then put them back down and moved ingredients around the counter for no reason) so as to replicate the atmosphere that Bob must make his burgers in. For context, his kids, Gene, Louise and Tina, are usually in a perpetual state of open rebellion. Finally, the shallots and thyme were sautéed in a separate pan with a pinch of salt to bring out the subtle heavenly flavor. This recipe is pretty simple. Just melt some of the Le Chevre goat cheese on top, toast the bread, and you’re good to go. I hope Bob’s Burgers has brought you the same joy and inner tranquility that it has brought me. *Note: TRMC didn’t use exact measurements for his recipe. The below ingredients are just really good estimates. Nice to “meat” you. Hey, you there. Put the 2 pounds of meat in a large bowl. Add salt and pepper. Mush meat until it’s no longer in log form. Add 3 eggs. Mix (preferably with your hands). What shallot be, shall be. Peel your shallots. Mince your shallots. Put your shallots in a small pan with olive oil. Cook on low heat for now. Thyme Time. Mince the thyme and add to the shallot pan. Cook on low until the shallots start to turn brown. Then remove from heat. Reacquaint yourself with the meat. Sear-iously. While the shallots are cooking, add 1-2 tablespoons butter and 1-2 tablespoons olive oil to a large-sized pan. Increase heat to high. Once the butter begins to bubble, add palm-sized lumps of meat to the pan. Sear each side of the burger for 3-4 minutes, then decrease heat to low and cook for about 5 minutes, flipping occasionally. *Note 1: We used both butter and oil in the burger pan for a richer taste. *Note 2: searing each side of the burger keeps the juices in! *Note 3: we made sliders (mini-burgers), hence the “palm” size. Meanwhile…toast your buns. While the burgers are cooking, start toasting your buns. Either use a toaster or an oven. We used a toaster. *Note: to toast buns in oven, bake at 350 degrees Fahrenheit for 5 minutes. Gently warm your baby spinach. Wash your baby spinach and put it in a small pan with red wine vinegar. Warm (but do not cook). Meat your maker. When your burgers look just about done, add the chévre to the top of the meat, then add the shallot/herb mixture. THEN. Add the baby spinach. Place in warmed burger bun. Serve NOW. We tried to be fancy and use fancy bread. But really. Just use normal buns. It’ll hold a whole lot better (and look better too). Did you try to put a lid on your pan and start a small explosion like I did? Try this neat trick that The Really Messy Cooker taught me (GENIUS!). 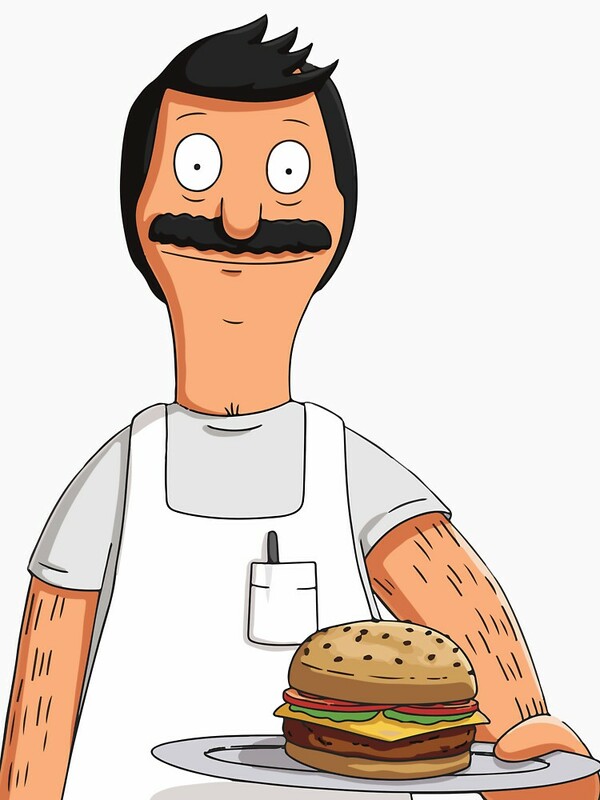 Want to see Bob from Bob’s Burgers? Clickers. 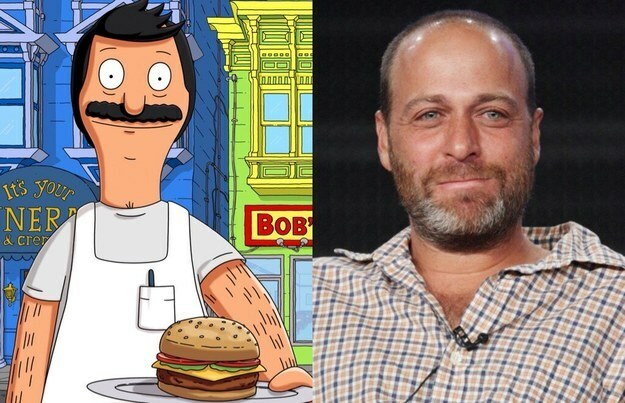 Want to see the actor who plays Bob in Bob’s Burgers? CLICKS. Guess what. The guy who plays Bob also plays Archer from Archer. Click here to see a hybrid Bob/Archer.